1. Back in the red: U.S. stock futures are dipping Friday morning, indicating Wall Street may be set for its fourth negative trading day of the week. Thursday bucked the week's downward trend: The Dow Jones industrial average jumped 0.5%, the S&P 500 eked out a 0.2% gain and the Nasdaq rose by 0.4%. But European markets are looking weak in morning trading, and most Asian markets ended in the red. 2. Stocks to watch -- Dow, DuPont, Ford, Adobe, DAVIDsTEA: Dow Chemical (DOW) and DuPont (DD) announced Friday that they are merging to create DowDuPont, a new industrial titan worth $130 billion. 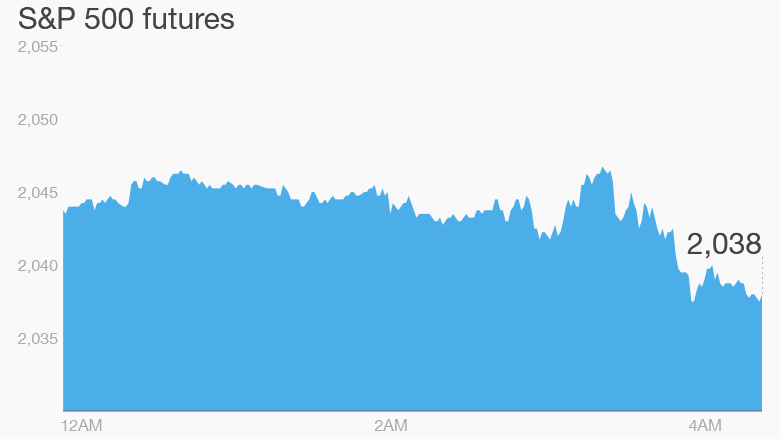 The move was widely expected and shares surged earlier in the week. Now the deal is confirmed, both are dipping premarket, with DuPont stock down by 5%. Ford (F) will be in the spotlight after the American automaker announced it was making a big push into electric vehicles, investing another $4.5 billion by 2020. The company said more than 40% its models will come in electrified versions by the end of the decade. Shares in Adobe (ADBE) look set to surge Friday after the company issued a better-than-expected earnings report. And investors are expected to warm to the specialty tea company, DAVIDsTEA (DTEA), after the young firm reported results that exceeded Wall Street expectations. The Canadian-based company reported double-digit sales growth in the third quarter, but made a small loss. 3. Mystery in Hong Kong: Asian markets were led lower by a 1% fall in Hong Kong after another top Chinese executive was reported to have gone missing. Shares in two Hong Kong companies linked to a Chinese conglomerate were halted on Friday after its chairman was reported to be missing. Fosun International and Fosun Pharmaceutical said trading was suspended "pending the release of an announcement containing inside information." Chinese business news site Caixin reported Thursday that Fosun Group had been unable to contact its chairman, Guo Guangchang. Several corporate executives and senior government officials have been vanishing lately, and some never return to their posts. 4. Economics: The Census Bureau will report November retail sales figures at 8:30 a.m. ET. The University of Michigan Consumer Sentiment Index for December is scheduled for release at 10 a.m.
5. Oil still sliding: U.S. crude prices are hitting the skids again, falling by about 1% to trade around $36.50 a barrel. This is the lowest level oil has seen in nearly seven years.